Obituary – Dewasme, Joline Marie (Kirby) « Perry High School Alumni Association, Inc.
Funeral services for Joline Marie (Kirby) Dewasme, 47, of Garland, Texas, will be held in Stillwater in the First United Methodist Church Thursday at 2 p.m. Burial will be in the Elm Grove Cemetery, south of Stillwater. A memorial service will also be held in Garland Saturday at 10:30 a.m. in St. Phillips United Methodist Church. Strode Funeral Home is handling the arrangements. Joline was born in Blackwell Aug. 24, 1960. She went to be with the Lord on Good Friday, March 21, 2008, in Minneapolis, Minn., surrounded by family and friends following complications from her second double organ transplant. Her father was a Methodist minister. She lived with her family in Lissie, Texas, then back to Oklahoma, living in Altus, Perry and Tahlequah. 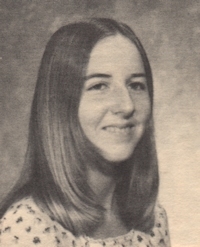 She graduated from Tahlequah High School in 1978 and attended Oklahoma City University where she met and married her first husband, Mark Wood, in 1980. To this marriage was born Michelle Marie Wood, Joline’s pride and joy. Joline met and married her second husband, Steve Dewasme. They were best friends, partners and truly loved each other deeply. Until she went to be with the Lord, they were inseparable. Joline was a faithful child of God, and the church was a very vital part of her life. She was an active member of the Dallas Emmaus Community. She was determined to be a survivor regardless of the many health issues she had. Joline was a source of inspiration to so many different people. As a mother she almost daily told Michelle that she was “the ‘bestest’ daughter in the whole wide world” and Joline strived to be the best mother in the world to Michelle. She loved holidays when the whole family would spend time together and celebrate the season. Joline is survived by her husband, Steve Dewasme, and daughter, Michelle Wood, as well as her father and stepmother, Tom and Nelda Kirby of Perkins; her brother, Gene and Jennifer Kirby of Dodge City, Kan., two sisters, Linda and Chris Ball of Pryor and Ramona and Grant Gerondale of Sand Springs; and six nieces and nephews. She is also survived by her aunt, Lodiene Nickels of Stillwater; uncle, Jim and Barbara Kirby of Perkins; and many first and second cousins. She was preceded in death by her mother, Maxine Kirby and both sets of grandparents. Joline believed that the recycling of healthy organs was one of the greatest gifts a person could leave for others. She would urge each person to consider marking his or her driver’s license as an organ donor. Memorials may be made in Joline’s name to the church of your choice.